Although it seems like yesterday, two weeks ago I took my son to the Saint-Enfant Jésus Church at St-Joseph and St-Dominque for the 2010 Expozine, which is held in a very warm basement with a low ceiling. This may sound unappealing, but in fact, it's wonderful. This is a large room filled with very creative people, presenting some over-the-top, fun material. And besides they serve beer. You would expect that there would be only zines as the name implies, but in fact Expozine also features book, graphic novels and comics. It's actually a small press expo. This year, I had the impression that the work was a little more polished than in previous years. Polished is fine, but I love the very basic zine, just so I can imagine what it might be like without the typos, formatting glitches and slips of pen. These kinds of errors make a zine much more human. A zine is a DIY self-published, small-circulation publication that uses original and/or borrowed texts and images; in other words, it can be anything you want it to be because you're the author, illustrator, graphic artist, editor, promoter and salesperson. I recently reviewed a political zine (review coming soon) that folded out into a poster, but for maximum reading pleasure, you had to read it as you unfolded. These zinesters combined the themes of raspberry jello and the Red Scare to great effect and the price was right--two bucks. 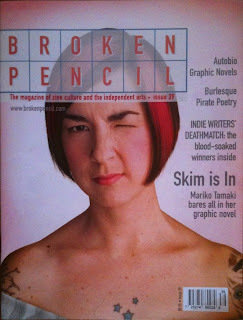 As I walked around Expozine, I came across the table for Broken Pencil, a Toronto-based magazine that specializes in zine culture and independent arts. I remembered reading a Broken Pencil feature a few months earlier when I was researching work by Sonja Ahlers. They were giving out copies of past issues and a year's subscription for $10.00 at the table. I leafed through a few and saw several familiar names, all of them young writers I had never heard of until October of this year when the Canada Reads named its Top 40 Novels of the Decade. It appears that Broken Pencil has a good eye for talent. I decided to buy a subscription. From the two issues I was given, I learned that Heather O'Neill, a past Canada Reads winner, started out contributing to a zine. Zoe Whittall, whose recent novel was one of the Top 40, also began with zines. The graphic novels of Mariko Tamaki and Jeff Lemire were also named in this year's Top 40, and Lemire is the first graphic novelist ever to become a Canada Reads finalist. Did they, too, start out with zines? It wouldn't surprise me if they had. : Expozine's Broken PencilTweet this! Sounds pretty cool, good luck with it! Than,ks, I realize that zines aren't everyone's cup of tea, but they can be extremely creative and entertaining. I'm also about 20 years late with zines. They started in the 80s, really hit their stride in the 90s and then with the Internet, they became e-zines and blogs! Thanks for coming by again Lazarus.